A really beautiful canapé, it's great for all your guests who like the freshness of sushi. I always get a great reaction with this one. There are thousands of recipes for Canapes out there, but few that seem worth the trouble to me. This is one of the really good ones. 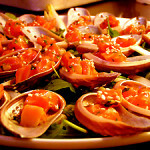 Here I use the recipe in mussel shells for canapes or you can mold the mixture in rings into small patties directly on a plate and serve as an appetizer, brunch entree with a small salad or as a type of tapas for something more informal. 450 grams raw salmon (freshest, best quality) Cut into small cubes 3 to 4 millimeters square. Cut up the salmon and put in an airtight container and refrigerate until needed. In a small jar grate the ginger, and add the soya, Thai fish sauce, red wine vinegar, sugar, lime juice and shake well to combine and dissolve the sugar. 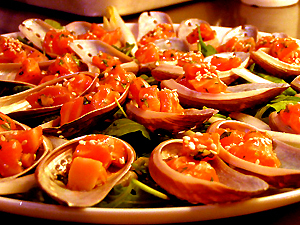 When ready to serve, take a large serving tray and loosely arrange all the shells in a decorative pattern. Combine all the salmon and the dressing, add the chopped coriander and spring onions and 1 tbsp sesame seed oil. Combine gently and well and let sit for about 5 minutes only. If this marinates too long it will kill the taste of the salmon. The salmon should not be sitting in a pool of soya! Use your judgment and taste as you go. Also taste for lime juice as that is what gives it, it's great fresh taste. Take a small spoon and spoon 3-4 small cubes of the tartar into each shell. Sprinkle the canapes with some of the toasted sesame seeds and/or some extra finely chopped coriander and serve chilled but not cold. This is a balancing act. You want a good balance between the salty tastes of the fish sauce, soya and the sour tastes of the vinegar and lime juice. Be careful with the sugar its for balancing the salt and sour. You can if you like add a bit of chili but I think this is much better without. Don't throw away your old oyster shells you can reuse them for this. You can also purchase in your local hobby shop bags of small shells that you can fill, wash and reuse.